Preheat oven to 220°C/200°C fan-forced. Line two baking trays with baking paper. Cook bacon in a small frying pan over moderately high heat for 5 minutes or until crispy. Transfer to a bowl. Add spinach and ricotta; stir to combine. Season. Cut each pastry sheet into quarters (triangles). 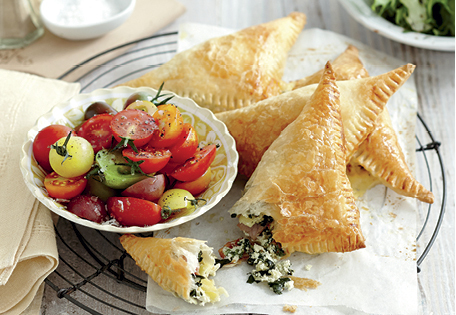 Place spinach mixture on half of each of the pastry triangles, then top each with two cheddar triangles. Fold over pastry to enclose filling; crimp edges of pastry to seal. Brush with egg. Place on prepared trays; bake for 15 minutes or until golden. Serve with salad.